NamesPro is a Canadian domain service provider, providing web developers and designers out of Canada with low cost and high-performance domain. NamesPro offers a complete set of web hosting packages that include domain registration. The company is CIRA certified as well as been ICANN accredited. The clientele of the company shows the level of trust users have in the company as well as the capabilities of its domain servers. Repeatable and thriving businesses, medium- size associations and even government agencies employ the services of Namespro. Namespro is preferred to other domain providers in Canada due to its ease-of-use, faster and high-performance domain and customer service/support team available at for any problem you may encounter 24/7/365. The following are some of the domain services that NamesPro offers. Free domain parking, auto-renewal, IP forwarding and domain gripping. French IDN domain is available for .ca extension. domain servers available at the company at reasonable pricing. Note: Expired non .ca domains are not possible to transfer while domains with .ca extensions can be transferred within 30 days of expiration. Availability of a 1-year extension on domain term. Single transfer or bulk transfer are supported on NamesPro. Value; which comes with a single domain, supports personalized email addresses and allows file sharing. This is ideal for starters and hobbyists. Has Plesk control panel and up to 5GB disk space and 50GB monthly bandwidth. Standard; this allows up to 10 domains at standard bandwidth. 10GB disk space and 100GB monthly bandwidth. Professional; which allows up to 20 domains and lets you track website traffic and users. Images are presented in a professional format. 20GB disk space and 200GB monthly bandwidth are supported on this option. Premium; this allows up to 50 domains with the highest disk space and number of domains allowed among all the options. 500GB monthly bandwidth. Other web hosting options available on NamesPro include email hosting, free DNS hosting and WHOIS privacy for users’ domain and websites. 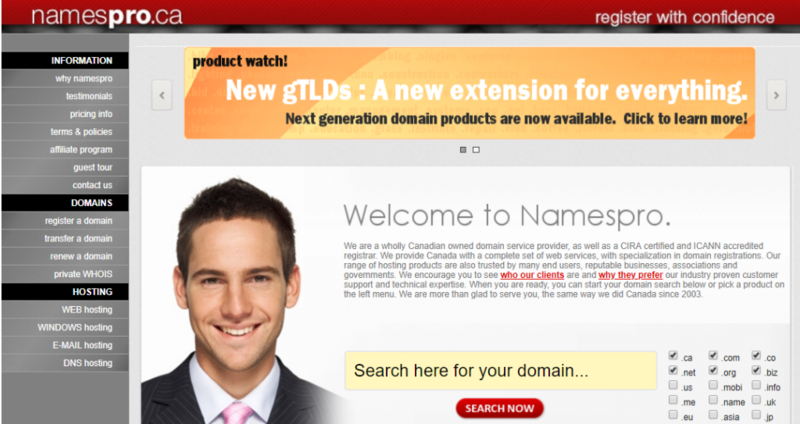 I have been with Namespro.ca for over 2 years now, and since the day I started trying out their services, I have been moving all my domains here from awful Godaddy. Namespro.ca is a Canadian business and being a Canadian myself, I tend to support local companies. Their pricing is fair, and their customer support is second to none. All inquiries, big and small, are answered within minutes. I do not understand how somebody could have rated them 1 star and I truly believe these are isolated cases. Being in the tech industry myself, I know how one can become frustrated easily when he or she is not familiar with the technology. It is often easy to just put blames onto others, but a more decent way would be to try to spend more effort to understand the problem. I give these guys 5 stars because they often go beyond to help whenever I need it. If you only operate one or two domains, you might not feel much. But for guys like me who own over 50 domains, customer support is the determining factor of what company I pick. Kudos namespro. Namespro support is frustrating! You can`t speak with them by telephone when technical issues occur. (They is NO PHONE NUMBER listed on their website!) All support must be done via an awkward support `ticket` system in which you send a message to them from their website. One big drawback with this system is that if you need a record of this request then you must print the web page screen ... I would expect they could at least email you a record of the request at the time you make the request. The other huge drawback is unacceptably long response times: in each of the 3 occasions that I submitted a support request ticket, they responded over 4 (four!) hours later. This isn`t even close to the 1.5 business hours that they supposedly `strive` to maintain. I agree with the other comment (by Glenn C.) that it would be so much easier to resolve issues and questions with a short phone call. - the only way to configure a whitelist for incoming email is to create a separate special "user account" for each email address and define your settings there (instead using the main administration control panel page or the users` webmail settings page). - if you use a POP3 mail client with SSL then you sometimes get a stupid popup box asking for userid, password and domain. I have been using them for a few weeks for email and will be cancelling to get a refund once I find a good hosting provider. I have been using namespro.ca for 3 years, all is well till you need support. you will spend hours going back and forth with emails when a simple 3 minute phone call would suffice but only an answering service is provided. Even after numerous request to call, nothing, just more emails without the required information. I have been using Namespro for 5 years, I am no genius on the web back end but they have the time and patience to assist when ever I get stuck and cannot solve a problem on my own. I just am amazed after years of other providers that I didn`t find out about these guys sooner, they make me look like a star all the time. well done and keep it up. The company offers high and good quality services and products in order to develop confidence in their clients so that they will remain stuck with this company , may be this is company’s strategy to keep their existing and new customers always with them. I think this is the strategy but may be this is company’s good service which they try to offer to all their customers and it works also as I one of their client really feel happy and glad with the services of the company. And it works on me at least as I have decided that I will be with this company in my future also to host my other websites. I really applaud the services of the company as it offers so many things which are really beneficial for hosting my sites and for my company too. The above given things are the basic need of any person who is in the need of a company to host their websites and all these needs are fulfilled here with the services of this company. The ticketing system which is available via online mode is simply great of the provider as it allows their clients to interact with their highly trained and exp customer care staff very fast and quick and very efficiently also if you have any queries or questions. Actually I am in the need of such provider only who can offer max level of customer support because earlier also I had various issues in the context of hosting of sites but that company’s staff also not supports a lot so this is my first most need and now I got the company who fulfil this need of mine. Namespro.ca is a great web hosting provider, it is a CIRA certified registrar and a company which offer the services of the domain and is based at Canada. It’s a good and an old company which was started in the year 2003 and in no time it has grown so much that now it becomes one of the leading registrars in Canada.I was looking for a provider and I got this and happy with this as it offers whole range of the services of domain from their advanced interface for the management of domain by which max no. of domains and registrant for each and every account can be handled to my web hosting plans and to my ticketing system via online mode. I was also happy as the plans they offer includes list of those features that offer bonus value. I was connected with namespro.ca from last 5 yrs., as I was searching for a provider who promised to offer reliable and dependable services of domain to their clients. And I am in the search of such services only so one of my friends suggests me about this company. And I used the services and feel satisfied as they offer what actually I am looking for. With the domain services, the level of technical and customer support is also reliable and great. I also felt confidence in myself as the support they offered is supported by the great technology and by this I feel secure and safe to a great extent as company has done some arrangements in order to provide safety to their client’s data also.